In this short series about my philosophy about what it means to be a prepper, we looked at learning about the things around you, prepping to live, and the right of self defense. In this post, we’re going to look at what you need to purchase and why. Getting the right supplies is crucial to survival. For a typical disaster or emergency lasting one month or less, having an adequate stockpile of water, food, sanitation supplies, emergency heating and light, and tools is more important than all the skills I promote learning. You can hunt, fish, be a great shot, know plumbing, electrical, animal husbandry, wilderness survival, gardening, car repair, HVAC, military tactics, and much more. If you run out of food and water, those skills can only help the urban prepper so much. In an urban setting, it’s impossible to grow all the food you’ll need. It’s unlikely you’d be able to forage for it or hunt for it. If food is really scarce, there’s little you can really trade for it. To be prepared, you must stockpile some food. A common prepper question: How to be a prepper with no money? It’s difficult. How can you stockpile food if you’re struggling to put food on the table today? How can you acquire a few emergency supplies when it’s tough to pay the bills? There’s no good answer for this. You must free up some cash. How is the rub. The problem with most financial advice is that it’s usually aimed at people who already have sufficient livable income. Cut back your cable TV. OK, what if you don’t have cable? Stop eating out at expensive restaurants. OK, you already don’t eat out. Don’t charge things on your credit card and pay high interest. Yeah, right. The middle class and, especially, the poor are hit by what economists call a “poverty tax.” Said another way, you pay high interest one way or another. Don’t charge and borrow money? What if your electrical bill is overdue and your electricity will be shut off? You don’t have to borrow to keep it on, but when it goes off, you’ll be hit with a huge reconnect fee. One way or another you’ll be *!!%*#. Many Americans are being bled dry by our financial system. The financial crisis of a few years ago wiped out the savings of many Americans. When they were forced to borrow, the interest paid went to wealthier people. The credit card companies started earning money again and the stock market went up. To some, it looks like America is doing well. Other’s see a different reality. It’s possible in the next ten years we’ll see a second American revolution because of this. There is a great gulf between what’s believed by different Americans. The one thing most Americans agree on is that elected officials of all stripes no longer represent rank-and-file Americans. The only thing I can say about prepping with no money is that household finances are like a football team: You have offense and you have defense. Your financial offense is your earnings. Your defense is how you spend your money. You need to get strong on both. You must do whatever you can to improve your situation. If you have the money, what to purchase? I’d start by putting aside food. Try for two or three weeks supply. Keep a week’s worth of drinking water on hand. Purchase one or two reliable firearms for personal defense and a few boxes of ammo. If you have this, you’ll be better prepared than the vast majority of Americans. 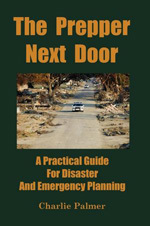 Preppers realize things can go wrong and they want to have the supplies to deal with it. I’m really hoping your philosophy has a section in it called “buy too much, too fast, and you may regret it at your leisure”. There is always a danger that newcomers get swept up in the “must have, minimum stock” world of the prepping and survivalist trade world. The lists of items (which conveniently are available from their online stores) they claim you should have are extensive. The “must have” gear, the “expert approved” labels. I’m hoping that the English phrase “Only fools rush in” means the same in American. Consider that whilst stockpiling is a good idea, what if you have to leave the safety of your home because you are forced to evacuate? Something city dwellers should be mightily concerned about. Just imagine a years worth of food, supplies, water, and you’re evicted day one. As I said, just a thought. Absolutely correct. I confess, when I have spare time, I watch the gear guys on youtube showing off their new equipment, guns, lights, knives, expensive “tactical” stuff. But I don’t buy-into that belief you need all the “survivalist” stuff. Especially the expensive stuff. I kinda dislike how some of my past favorite video blogs have degenerated into equipment infomercials. For field knives, I’ve basically relied on thee over the last 40 years. A 3.5″ Boy Scout one, a beat up western one, and a Buck Pathfinder. When I see a review and somebody says they’ve been using this knife for a month and you must buy one, yeah right, I think. My old brain still can’t wrap around the concept of a $500 ! flashlight. I like about a month of food and some water stored. My feeling is if you must flee, sure, it’s lost, but if you can stay, it can help you out a great deal. Thank you very very much for your great comments! I suggest ‘modularity’, starting from the bottom and working up. What can I carry every day without difficulty? What can I do or learn to do with those items? Then what can I add without it being visible, and what can be done with those additions? Next, what can be added in an unobtrusive pouch and what additional skills are available? How about in a practical size/weight backpack? My vehicle? My house? The advantage of this methodology is the flexibility to respond to what actually happens, not the one or two or three things you think may happen..
Equipment is good, but without skills it cannot reach its full potential. Skills are better, but usually can be enhanced with the correct equipment. Practical, realistic, thinking is the best; being caught unaware can be fatal. . Solid advice. You have a great blog by the way. Lot of good information.